Looking for a better alternative to Great Western style box replacement screens? Custom Advanced Connections, Inc. offers a full line of quality replacement parts and accessories to handle your sifting and milling requirements. From screen clothing to sifter socks we are here to assist you with your needs. If you own an old Great Western® screening product, avoid paying high O.E.M. prices by purchasing a comparable product from Custom Advanced. 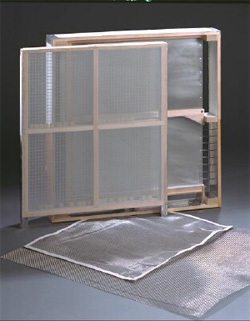 We offer box replacement screens & accessories to fit equipment manufactured by Great Western®, Buehler® & more. While we aren’t able to list every item we carry, many of them are shown below to give you a feel for our capabilities. Or contact Custom Advanced for assistance and we will help you select the right screen part for your application. Looking for Rubber & Polyurethane De-Blinding Balls?